Episode 21 - This is a big one; this episode covers the tangled details of the incident that sets off the rest of the story. At the heart of it, it is about Duryodhana and Shakuni cheating at dice to win from the Pandavas all their possessions and even their freedom. That much is clear, and the match culminates in the deliberate humiliation of Draupadi before the court. 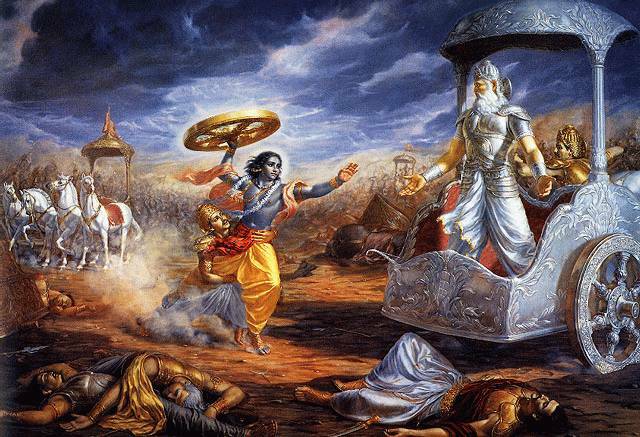 Bhima swears oaths to kill both Duryodhana and his younger brother Dushasan, and the future conflict all arises from the fears and hatred born from this moment. In detail however, many facts are quite confounding. For instance, Shakuni says Yuddistira is addicted to dicing but is not good at it. Where did this come from? There is no detail either before or after this story that would lead anyone to believe this about Yuddistira. Then there is the question of Yuddistira's determination to lose everything in the match. While he may be excused for going forward with the dice game ("for that is the eternal oath I have sworn"), but who really made him gamble away his kingdom, his brothers and his own freedom? These stakes were his decision and no one else's. Finally, everyone loves Bhisma and considers him a good man, but on this day he is strangely impotent and brain-addled. What explains the odd reticence among the Kuru elders? How is it that the entire court stood by and allowed the maltreatment of one of their own women? One thing is certain, and that is relations between the Pandavas and the Kauravas will never be the same from here on, and are trending for the worst! Hey. I meant to tell you how much i appreciated your retelling a while ago but forgot. I studied sanskrit and the mahabharata at uni and fell in love with both, but the mahabharata is so hard to digest. It is refreshing, then, to see it approached in such a way as you do. Krishna knows how many cold and dry journal articles i had to read during my studies. Keep it up, i'll follow you to the end. Yekollu: I suppose you are referring to Shakuni's resentment that his sister Ghandari was married to the blind brother (who wouldn't be king) rather than the younger brother Pandu, and that he swore an oath to destroy the Kurus. I recall that the BR Chopra TV show has this in it. This story actually is NOT in the Critical Edition (nor in the Bombay edition) of the Mahabharata. In fact, it is probably contradicted by what we do read in the original. For instance, throughout the story, whenever brothers (or sisters) are married, it is always the eldest who marries first. Therefore, there could not be any misunderstanding as to who Ghandari was engaged to, since both the older & younger Kuru brothers were unmarried. It was only AFTER Dhrtarastra was married that they started looking for a wife for Pandu. Secondly, the Mahabharata states that the alliance with Ghandara was an arranged marriage in which the kingdom of Ghandara paid a large dowry to Hastinapur for the privilege of marrying into the dynasty. This is revealing when contrasted with the marriages of Pandu: Kunti-- swayamvara, no dowry; Madri-- arranged marriage, large bride price paid to Madra. Thus Ghandara PAID for the alliance with Hastinapur, while Hastinapur PAID for the alliance with Madra (Madri), and no one paid for the alliance with the Yadus Kuntibhoju/Shura (Kunti). This leads me to believe that Ghandara was a lesser kingdom that was happy to pay for the chance to marry their princess into the Kuru royal family, even if it was to a blind prince. Third, Shakuni, who at some point inherits the throne of Ghandara and is made King, seems to spend all his time at Hastinapur with his nephew. What kind of kingdom did he have that he preferred to live in another king's palace?!? This, plus the dowry, implies that Ghandara was a much poorer & backward kingdom. Finally, I think Shakuni's destructive impulses can be more easily ascribed to his relationship with Duryodhana as his maternal uncle. If he could manipulate affairs among the Kurus to make his nephew the king of both Hastinapur AND Indraprastha, he himself would be in a position like Bhisma of elder advisor & co-regent. On the other hand, Shakuni had NO blood relationship with the Pandavas, so if they succeeded, Shakuni would have to go back to his second-rate kingdom and stay there! I make enough diversions away from the main story already, and I'm afraid it might turn people off, so instead I'm sticking to what's in the Mahabharata-- there's plenty to deal with just between the two versions I'm working with! I almost regret having used the Bhagavata Purana as an external source for just this reason. I don't plan on doing that again! Lawrence... I havent watched B.R.Chopra's T.V.Series nor have i read the Critical edition. My great grandmother used to tell me Mahabharata every night.It has been a long time and i dont remember the numbers. Shakuni has some scores of brothers and a king (again whose name i dont remmeber, but is in someway related to the Bharata clan) imprisons them all. The brothers are fed only one morsel of rice everyday. Now the brothers decide that one of them has to survive and bring the downfall lof the Bharata clan, they take lots and choose shakuni. Everyday the brothers forsake their morsel so that Shakuni can have an wholesome meal and they starve theselves to death. Its not that Shakuni is skilled in the game of dice, the dice themselves are made from the bones of his dead brothers and the do as Shakuni commans them to do. Wow, that's an interesting story! I've never heard of that one before. I like the image of the Dice as the bones of his murdered brothers. There's nothing even close to that in the two versions I've been using for the podcast, and it is clear that imprisoning or deposing kings was considered VERY un-ethical at the time, so I don't think Vyasa would insult the line of Bharata by telling a story where one of them imprisons & kills a king and his sons. The one king who does imprison & depose other kings is Jarasandh of Magadha, and this is enough to justify his death, according to Krishna. It would also be very unlikely that if there were such a history murder between the Kurus and the Gandharans, that they would then consider a marriage alliance so soon afterward! You'd think the Kurus would be a bit reluctant about taking a guy whose brothers were murdered by Kurus and making him a brother-in-law! Would they really want him hanging around the palace & advising the crown prince!?! I'm not going to push the Critical Edition on you-- I think you'd be disappointed by what's left out. But you ought to watch the TV show-- every single episode is free on YouTube, with sub-titles! Well i did some research into this, and here's what i found. Yekollu: I too did not watch BR Chopra's version of Mahabharata and I am glad.My foundation is on Amar Chitra Katha( very authentic), Shri Rajagopalachari's Mahabharata( excellent!!). Both these I treasure. Lawrence Manzo: Shakuni's dice are made from the backbone of his father. Shakuni and family were imprisoned by Duryodhana when the Pandavas made fun of Gandhari as she was married to a donkey.Her horoscope said that her husband would die immediately on being married to her. the donkey did die. This cleared the way for a normal marriage and the reason for marrying a blind king as proposals in India even then were thoroughly checked before finalisation. The Podcast series is Excellent one and I captures minute details too. But in Chapter 21 I find a mistake. Here at the time of humiliation of Draupadi, "Bikarna" try to stop all this. But by mistake you referred him as 101th son of Kuru King, which is not true. "Bikarna" is among 100 brothers of Duryadhana, not 101 th son of Kuru king. So, make this correction in next version. You are correct. Sorry about that. I confused Vikarna, who was Dhrtarastra's 20th son, with Yuyutsu, who was the king's 100th son, born of a serving girl. Yuyutsu stands out later as the only one of Dhrtarastra's sons to survive the war, because he defects to the Pandava side before the conflict begins. This is about the only thing Vikarna does in the entire epic. So I guess not all of Dhrtarastra's sons were that bad... Thanks! This is in tandem with the argument that Krishna was elevated to God-status later and refutes the 'miracle' of Draupadi's robes magically appearing out of nowhere. I have just started listening to your podcasts and it goes without saying they have been wonderful and enlightening. It is in tandem with the argument that Krishna was elevated to God status after the epic was conceived and helps refute the 'miracle' of Draupadi's robes magically appearing out of nowhere. And it goes without saying that your podcasts have been immensely enlightening. Thanks for the article. There's no end to the things you can discover in the text. In the Critical Edition, they kept the disrobing scene, but removed the association of Krishna with the miracle. In this version, there is no mention of Krishna during the entire dice game. I have been studying early Buddhism lately, and according to their tradition, the king of Mathura converted a century or two after the Buddha. They say that Mathura was already home to a thriving literary culture, and was producing Hindu texts. With the arrival of Buddhism, they started writing Buddhist texts. It is said that they even introduced the concept of Bhakti to Buddhism! I've forgotten at the moment where I noted it in the podcast, but there is only one city every mentioned with familiarity in the epic, and that city is Mathura. They lovingly mention the arrangement of the city among some hills. It made me suspect that if the author was personally familiar with any city mentioned in the epic, it would have been Mathura. It then occurred to me that maybe it was the writers in Mathura who reworked the Mahabharata and made Krishna more than just a peripheral character. My theory is that when Buddhism challenged the Brahmanical system, one argument the Buddhists made was that they had instructions from a genuine, enlightened teacher. The ancient Hindu tradition was based on the divine Vedas, and did not have any great founder, like the Buddha. I imagine the Hindus of Mathura looked around in their own literature and realized that they did have a great teacher, he was Krishna in the Mahabharata! Not only could Krishna's teachings out-do the Buddha, Krishna was also the Vasudev, the "hero of the age" in the Jain tradition. I imagine that this was the time, just before the city converted to Buddhism, when the epic was re-worked and Krishna got a promotion. That's just speculation, but it's fun anyway. Thanks for keeping in touch. Thanks for sharing you thoughts. It might be speculation, but it could well explain Krishna's apotheosis. I find it quite paradoxical that Krishna, if stripped of all his divinity and viewed only in the context of the Mahabharata is so different than how he is believed to be in popular imagination today (his younger self at least) by many Hindus, i.e the playful, mischievous cowherd and a favourite of all the milkmaids.